It is well documented1)This piece is based on research with Nick Bloom, Renata Lemos, Daniela Scur and John Van Reenen. that firms vary greatly in productivity, even when looking within narrowly defined sectors. This finding, which continues to be replicated across countries and industries—including the public sector—has paved the way for countless attempts to understand why such differences exist. Among the possible factors considered, management has traditionally been the one with the “highest ratios of speculation to empirical evidence” (Syverson, 2011). A casual walk through the business section of any library would provide evidence for the above statement. Countless—and often conflicting—books promoting “must-do” management ideas or desired managerial behaviors happily coexist, while new (and typically untested) management philosophies materialize with increasing frequency. 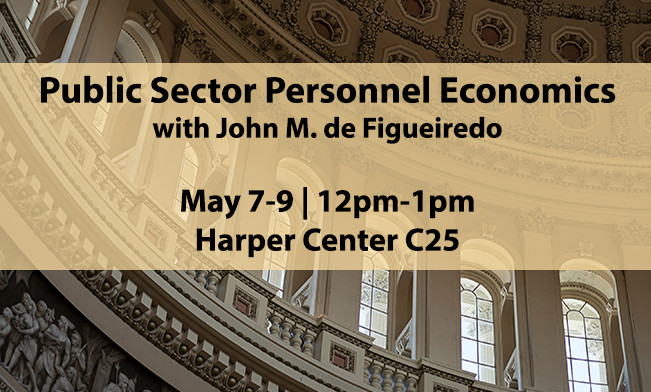 In the past few years, new initiatives seeking to evaluate the role of management in productivity and organizational performance in a more systematic manner have emerged, both for the private and the public sector. In this short piece, I will summarize the main features of this new “empirical approach” to the study of management, a few of the empirical findings these new data has uncovered, as well as some of the puzzles raised along the way. In 1887, Francis J Walker, the first president of the American Economic Association, recognized the importance of managers—“men who have high power of administration”—as sources of differential profitability across firms. It is perhaps surprising then that the study of management and managers has since remained primarily outside the realms of economics research. A primary reason for this lack of “attention” is the fact that management does not naturally lend itself to empirical investigation: There is no natural measure of management as an input of production. Unlike labor or capital, management is a form of intangible capital that does not have natural units or standardized prices. In fact, management investments are often made within firms in ways that are not fully captured by standard economic accounting methods. 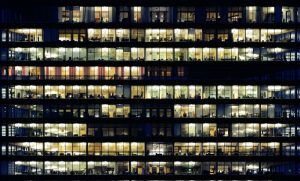 The World Management Survey—a project that I have co-led with Nick Bloom and John Van Reenen for the past decade—has tried to bring the study of management back into economics research through the creation on new large-scale datasets that measure the quality of management across and within countries at scale, in both the private and public sectors. 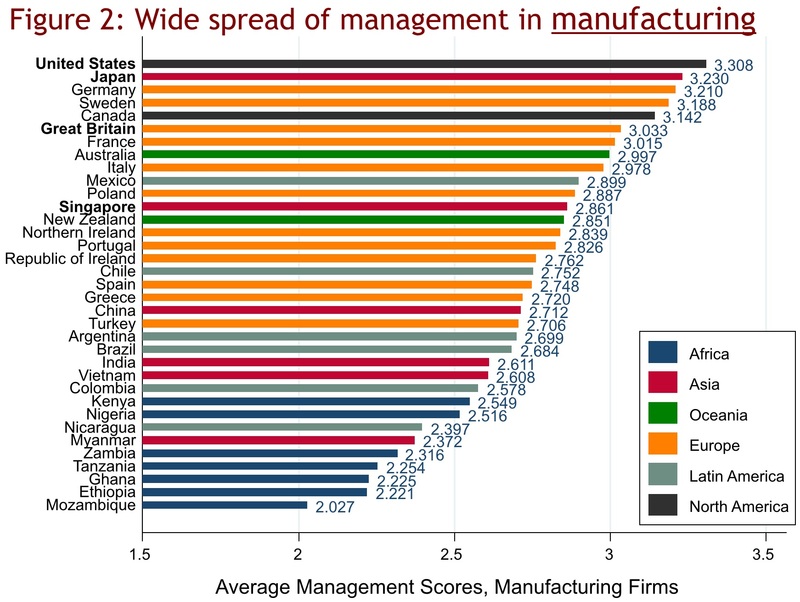 The WMS project has tried to sidestep the challenges inherent to the measurement of an intangible factor of production by following two basic principles: First, by focusing on the adoption of a set of 18 managerial basics, which could arguably be considered “best practices” (in operations, monitoring of production, target setting and people management) rather than more sophisticated—and arguably more contingent—managerial domains such as business strategy; secondly, by putting a lot of emphasis on the measurement process itself in order to minimize the noise that is inherent to this exercise.2)All the methodological documents, training materials and data emerging from the WMS are available to interested researchers on the project website. With this approach, we were able to measure the adoption of managerial best practices through a simple “management score”—an index ranging between 1 and 5, with 1 signifying the lack of adoption and 5 the full adoption of the practices included in the survey—across more than 12,000 organizations in 35 countries. The adaptation of the basic methodologies to self-responses in partnership with the US Census further extended the reach of the project, allowing us to use similar principles to collect data on more than 50,000 manufacturing plants within the US, and several thousands more in 9 other countries (more details on the work with these international statistical offices can be found here). With this data, we could finally go back to the statements made by Walker, and directly study the relationship between management practices and firm performance in large samples. 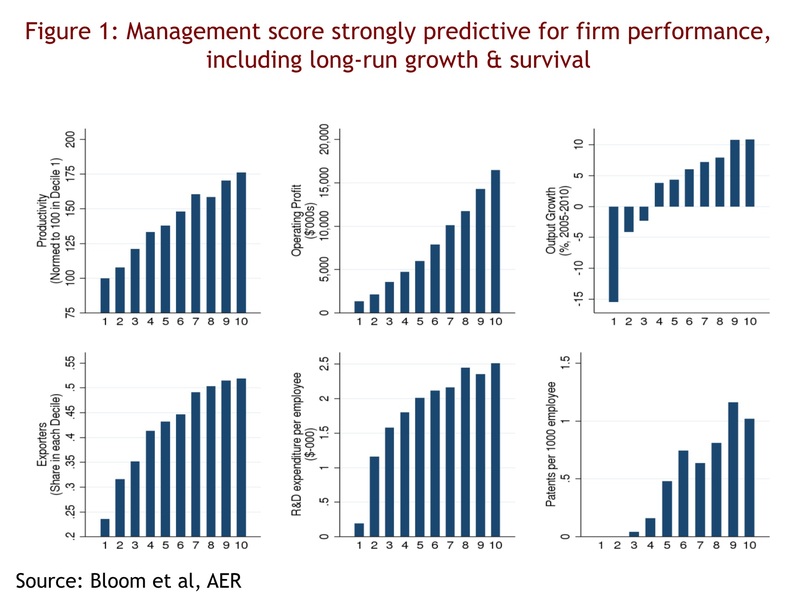 While it was reassuring to see a relationship between management and performance in the data, it was also somewhat puzzling to observe such large variations in the adoption of what—after all—should be basic and well-known management practices (so basic, actually, that the celebrated management guru Michael Porter claimed they could not serve as a source of sustainable competitive advantage, as such practices could be easily imitated across organizations). 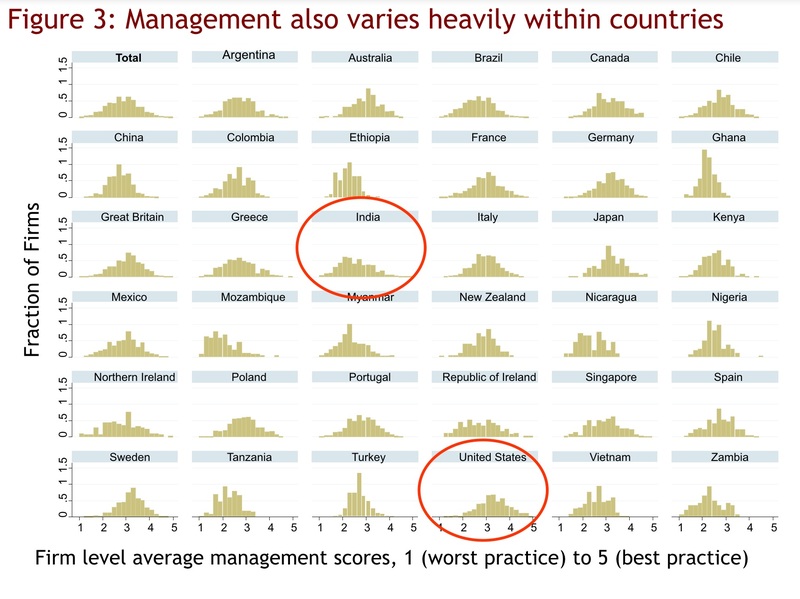 These variations are evident in Figures 2 and 3, which show the differences in the management score across countries (Figure 2) and within countries (Figure 3) (both taken from here). Taken together, this evidence does not isolate a single factor driving the heterogeneity in management across firms, but rather reveals a more complex system of both contextual and organizational factors coming into play, and perhaps reinforcing each other. Overall, the accumulating evidence shows that management does indeed matter, and that the diffusion of deceptively simple managerial practices may actually be much harder than what originally assumed in both management and economics. Measurement: As mentioned above, recent partnerships with statistical offices around the world have shown the feasibility of measuring intangible factors such as management at scale. While much progress has been seen in manufacturing, more remains to be done in other significant sectors of the economy. A case in point is health care, and more specifically hospitals. Hospitals represent approximately 5.6 percent of the US economy and, like manufacturing, there is evidence of tremendous productivity differentials across organizations in the delivery of care. Extending the measurement of management practices in this important sector of the economy is likely to provide new insights on the sources of performance variations across hospitals, and possible policy approaches to address performance gaps. Causality: Another area that is rapidly developing but certainly deserves much more attention is the study of the causal effects of management and performance through cleverly designed randomized controlled trials. So far, the evidence on the causality of management is based on studies emerging in micro and small enterprises in developing economies.4)See for example It would be valuable to explore whether management practices can effectively be change, and what the causal effects of these changes are, in larger firms and more developed countries, where organizational frictions are likely to play a more important role. Training: Finally, it would be worthwhile to think about ways in which the evidence emerging from these recent empirical studies could be brought back into managerial training course, at both the MBA and executive levels. “Management basics” are often taken for granted in these graduate management courses, but the wide disparities observed in the data (and even within large organizations in the US, as the Census project demonstrated) suggest that the barriers to execution of simple administrative routines continue to exist, even within the most sophisticated industries. There would be even more value in focusing these basics among in industries in which promotion to managerial roles is often not tied to managerial expertise such as for example, research intensive and clinical settings. In summary, research has shown that studying the causes and implications of management across organizations can be of much benefit to economics. While much remains to be done, the evidence so far suggest that variations in this key factor of production may have large implications for performance, at both the firm and country level. Understanding why management quality varies across organizations will help us advance the field and develop better policies for improving management and productivity. 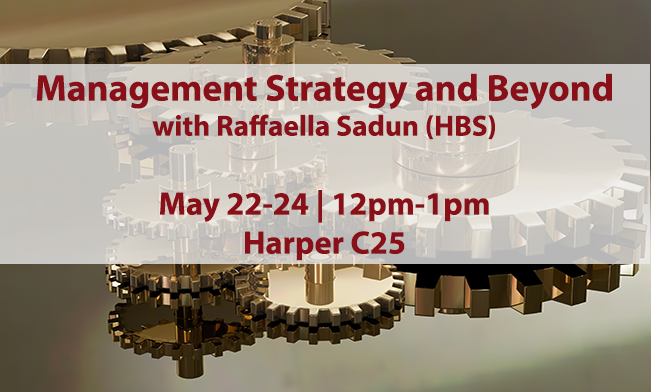 Raffaella Sadun is the Thomas S. Murphy Associate Professor of Business Administration in the Strategy Unit at Harvard Business School. What Differentiates White-Collar Criminals From Other Executives? 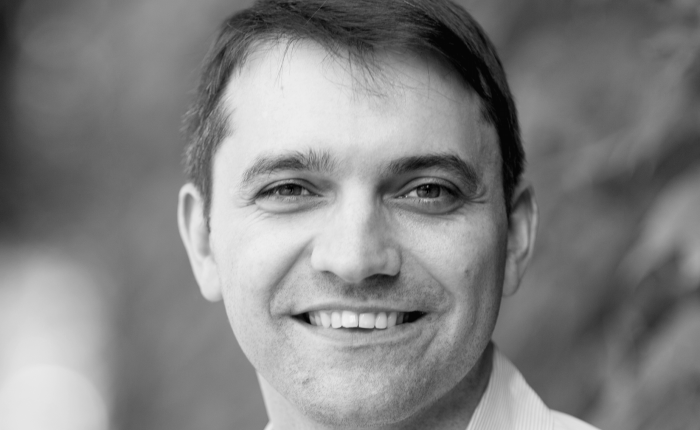 A Q&A With Eugene Soltes Where Friedman Was Wrong Let Data Guide Legislation: Stifling Shareholders in the CHOICE Act? 1. ↑ This piece is based on research with Nick Bloom, Renata Lemos, Daniela Scur and John Van Reenen. 2. ↑ All the methodological documents, training materials and data emerging from the WMS are available to interested researchers on the project website.